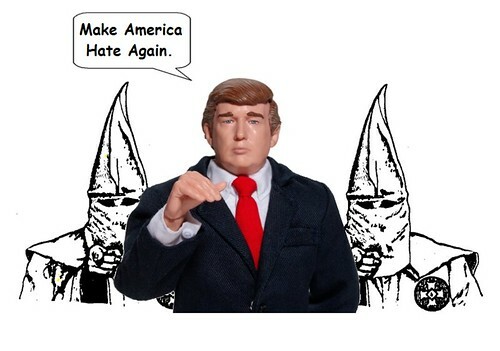 Republican presidential contender Donald Trump had already been endorsed by the white nationalist American Freedom Party, neo-nazi Daily Stormer, and white nationalist outfits including American Renaissance, Occidental Dissent, White Genocide Project, Council of Conservative Citizens, and the League of the South, but the racist endorsement that finally got the attention of the media — and rival GOP campaigns — was the endorsement of Trump’s candidacy by David Duke, former Grand Wizard of the Ku Klux Klan. But Mr. Duke didn’t just endorse Donald Trump; he first did that last August. Why is the racist tide behind Trump finally an issue? It’s a function of the 2016 GOP campaign’s odd progress. GOP politicians and media commentators first regarded the Trump candidacy as a flash-in-the-pan publicity stunt that would quickly blow over. The Republican Party, though, had already reduced itself to political self-parody, a boiling Tea Party kettle of steaming resentment, and that’s the force powering the Trump locomotive. But it’s not just ex-klansman David Duke. Current leaders of the Ku Klux Klan are urging members to support Donald Trump. And Mr. Trump is returning the favor. By stoking the fires hate, the Trump campaign is helping recruit new Klan membership. This entry was posted on March 1, 2016 at 3:06 pm and is filed under politics, racism. You can follow any responses to this entry through the RSS 2.0 feed. You can leave a response, or trackback from your own site.